Photo: Eight members of a family are burnt to death in a fire originated from an electric short circuit at a house in Aramnagar area of Joypurhat on November 8, 2018. 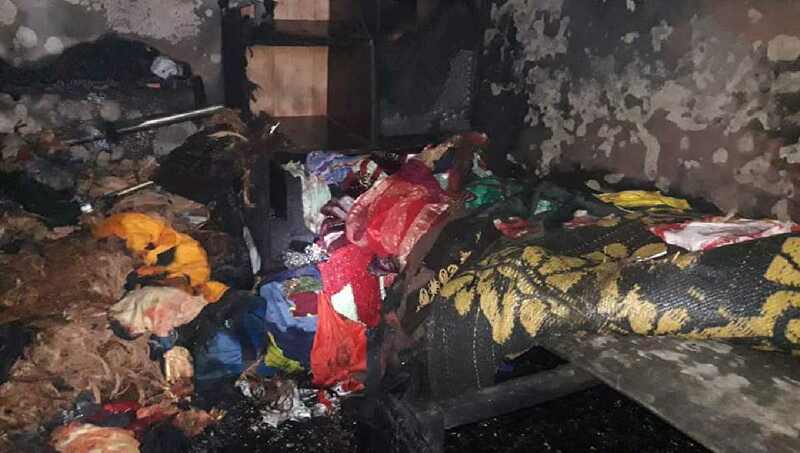 Joypurhat, Nov 8 : Five people, who suffered serious burn injuries in a fire which broke out at a house in Aramnagar area of the district on Wednesday night, died early Thursday, raising the death toll to eight. The deceased were identified as Dulal Hossain, 71, father of Abdul Momin, Momin’s two daughters — Hashi, 12, and Khushi, 12, and Parina, 34, wife of Momin and her six-year-old son Nur. Earlier, three members of the family– Abdul Momin, 38, his mother Momena Begum, 62, Brishti, 14, daughter of Momena, were burned to death and five others sustained burn injuries as the fire broke out at the house around 9 pm following a short-circuit. Sirajul Islam, inspector of Joypurhat Fire service and Civil Defence, said the fire originated from electric short-circuit at the house of Abdul Momin, a poultry trader, and it spread soon, leaving three people dead on the spot and five others injured. On information, a firefighting unit went to the spot and put out the fire. The injured — Dulal, Hashi, Khushi and Parina and Nur — were taken to Joypurhat Modern District Hospital where doctors referred them to Dhaka Medical College Hospital burn unit. All the victims died on the way to Dhaka Medical College Hospital around 5:30 am, said Sirajul Islam, officer-in-charge of Sadar Police Station.